352, and 353) incorporating a ring-expanded seven-membered ring sugar (e.g., 351). The 3'-(S) isomer of 350 gave only the corresponding epoxide 352 . A synthesis of spectinomycin together with the preparation of its 5'-«-butyl analog (replacement of the methyl group with «-butyl group) has been described. The 5'-«-butyl derivative (trospectomycin or 6'-«-propylspectinomycin) showed potent antibacterial activity and is the only aminocyclitol antibiotic that is active against anaerobic bacteria . Methylation of a selectively protected derivative with diazomethane in the presence of tin(II) chloride has been used to prepare 5-O- and 6-O-methyldihydrostrep-tomycin. However, these antibiotics were only slightly active, indicating the importance of C5 and the hydroxyl groups at positions 5 and 6 for binding to the bacterial ribosome . 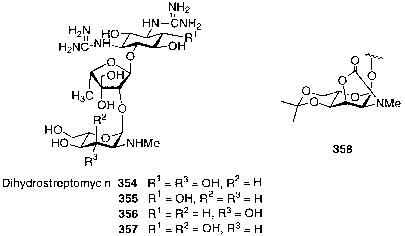 A series of dihydrostreptomycin analogs modified at the guanidino groups was synthesized. Among these, an analog with a methyl group in the guanidine at position 1 was nearly as active as dihydrostreptomycin, but all analogs having a substituted guanidino group at position 3 were devoid of activity . Photosensitive derivatives of streptomycin (nitroguaiacol derivatives) have also been prepared by modification of the streptose unit, to study the mode of action of the antibiotic . instance, condensation of dl-validamine with a bromocyclenitol derivative furnished stereoisomers of validoxylamine A , and dl-validoxylamines A and B were prepared from condensation of the epoxycyclohexane 359 with the valienamine derivative 360 under thermal conditions [191,192]. Likewise, racemic stereo- and regio-isomers of validoxylamine A were prepared , and ^-glycosylation of validoxylamine A (361) with an a-d-glucopyranosyl chloride derivative led to the formal synthesis of validamycin A (365)  (compounds 359-366 ).